The Clothes To Pose Mankinis were recently used on Celebrity Big Brother for the hunk off competition. Presenting the widest range of Mankini Thongs currently available on the internet. Daring and adventurous, the Mankini Thong remains the standard "get me noticed swimwear. For those who prefer to turn heads. Try one of our Mankini Swim Thongs. You won't be disappointed! We use high quality Italian EUROJERSEY fabric for the manufacture of our mankini. and provides a comfortable figure hugging fit. All prices exclude postage and packaging fees. The borat mankini became popular after the borat movie was released. The infamous lime green borat swimsuit worn by borat containing his jingle jangle bits was immediately taken up by fun and attention seekers all over the world. 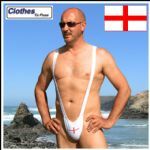 Here at Clothes To Pose we offer the borat mankini in a choice of colours. This range consists of RED | BLACK | PINK | LEOPARD and many more coloured borat fancy dress costumes. If you would like a different borat swimsuit then why not give us a try? The borat mankini is great for stag nights, fancy dress parties and is also an alternative swimsuit for those who dare to wear it. Need a head turning fancy dress outfit? Try one of our borat fancy dress costumes. You will not be dissapointed....!